Seth Anandram Jaipuria School (SAJS), Lucknow, celebrated World Book Day for the third successive year with great fanfare. The event was a celebration of authors, books, characters, and reading along with various fun activities. The Chief Guest for the occasion was Ms. Pooja Agarwal, Pro-Chancellor of Shri Ramswaroop University and Dean of Shri Ramswaroop Memorial Group of Professional Colleges, Lucknow. The event started with a parade of Story Book characters where students were dressed up like their favourite literary characters and authors. There was tremendous applause from the audience when they saw characters like Akbar-Birbal, Sherlock Holmes, Matilda, Tenali Rama, Chandrakanta, Portia speaking about their characters. There were authors like Ved Vyas, Robin Sharma, Vivekanand, Enid Blyton etc. It was followed by a skit titled- ‘The Crazy Story’ where the narrator of Red Riding Hood had a difficult time explaining to Snowhite, Spiderman, the Three little pigs and Cindrella’s Prince, that they were in the wrong story. Speaking on the occasion, Ms. Pooja Agarwal said, “Reading is an investment, which has great returns and books are our true friends. The magic of books has been there since time immemorial. Students must be encouraged to read as much as they can which will add magic to their lives.” The School also organized an English Literary Display wherein the students under the guidance of the English teachers, created a little world of literary personalities. 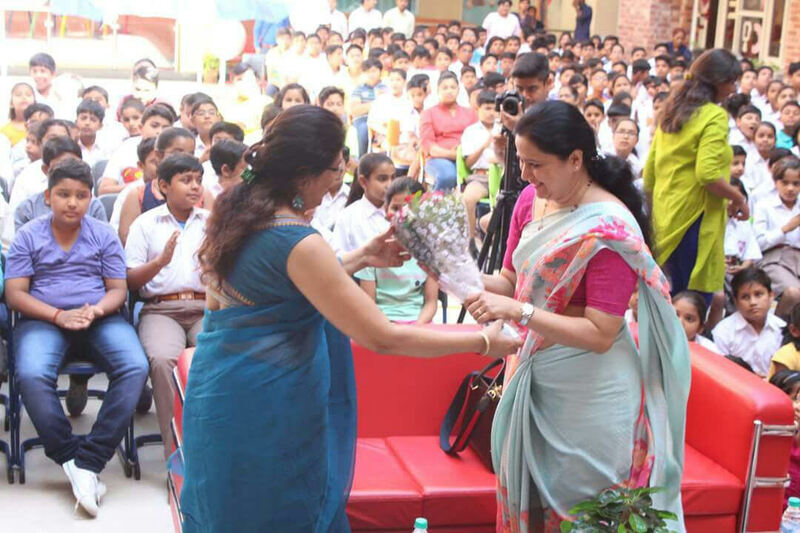 Following the same, the English Bibliophile Week was inaugurated by Ms. Pooja Agarwal along with school Principal, Ms. Poonam Kochitty. The Chief Guest was truly impressed with the creativity and hard work of SAJS students and teachers. The event concluded with a Vote of Thanks proposed by Mr. Pankaj. He read out a beautiful poem – ‘Kitaab’. Everyone left the event with a promise to read more, to open our imagination and enhance knowledge.